There’s nothing like instant gratification. We like our coffee brewed in seconds. Our movies streamed with a click. Deliveries at our doorstep in a day. And Italian fluency as fast as we can get it. Now, here’s where the disclaimer comes. Learning a language is, of course, not like making coffee or online shopping. It takes hours of practice, practice, practice. But that doesn’t mean we can’t speed things along. If you’re looking for the fastest way to learn Italian, we’ve got four study tricks you can use to give yourself a boost. Not only will they help you master key concepts quickly, they’ll also get you ready to hold real Italian conversations sooner than later—and that means even more opportunities to quickly advance your skills. Before we show you the best tricks to study, let’s set you up for success. Here’s how to create and organize your study routine for maximum learning in minimum time. Goals, goals, goals… I bet you’ve heard this word like a million times, but do you ever take it seriously? Do you actually consider setting goals for your Italian learning? If you haven’t done that already, now’s the time. 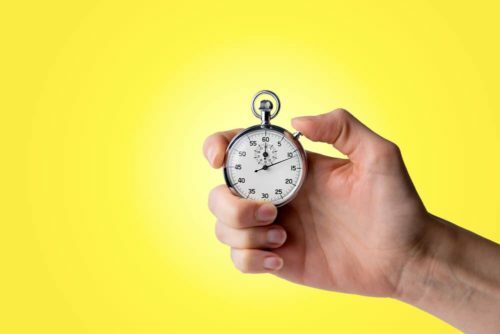 How much time can you devote every day to Italian learning? Where do you want to be in a week? A month? A year? What verb conjugations give you the most trouble? What vowel pronunciations do you need to practice? So, sit down, pick up a notebook and write down your goals so you can hold yourself accountable! How often do you actually study Italian? Is it a couple of times a month or even less? I know that you have a busy schedule and lots of commitments, but if you want to see some real results anytime soon, you better start studying regularly! Do it right now because even a few minutes per day will get you closer to fluency than none at all. If you want to see some results soon and be more consistent with your studies, stop wasting time and create a plan for yourself. First, decide how many hours per week you want to dedicate to studying Italian. For faster results, try to aim for at least two to three hours per week. Pick a time for your daily study routine. It can be before you go to work, during your lunch break or after work—whatever works for you best. Stick to your schedule! Don’t skip any learning sessions unless you really have to. Remember success doesn’t happen overnight. Yes, I know grammar isn’t your favorite thing. Italian grammar is quite complex. But there’s a way of studying smart to speed up the learning process. The trick is to start by learning the simple stuff. This will put your Italian studies on a solid foundation and will also boost your confidence and motivation, so you don’t burn out before the harder concepts arrive. Focus on the simple tenses, prepositions and pronouns (we’ll show you which ones below). They’ll be easier to learn because they have straightforward rules and few exceptions, but at the same time they’ll give you enough information and practice for you to begin basic Italian communication. If you mix the simple with the more complicated you risk encountering a mental block that would prevent you from studying, which can lead to giving up. If you want to improve fast, start with the indicativo (indicative) mood. It’s definitely easier to understand than the congiuntivo (subjunctive), which is a mood that has very specific and quite complicated rules. From the indicativo mood you can learn (the present tense), the past simple and the future simple. When learning the prepositions stick with le preposizioni semplici (simple prepositions). These are already a bit confusing because there are so many, so it’s better to stay on the safe side and leave the preposizioni articolate (that would be the prepositions combined with the definite articles) for another time. Same thing with the pronouns. First learn pronomi diretti e indiretti (direct and indirect pronouns) and then if you feel confident enough continue with the combined ones. Vocabulary—it’s extremely important, but sometimes it’s just so difficult to remember all those new words, isn’t it? If you want to expand your vocabulary quickly, learn the most frequently used Italian words. This will make the most efficient use of your time and will quickly prepare you to start having Italian conversations—in fact, 90 percent of the vocabulary used by native speakers in everyday conversation is composed of about 2,000 words. You can find a complete list of those 2,000 words in the first section of this handy Memrise resource. Extra tip: once you’ve learned the words, start practicing them in context. Try to come up with different phrases for each word—that way you’ll not only remember them, but you’ll also learn some extra vocabulary. Keep a vocabulary notebook in your bag and add new phrases and words whenever you have a little bit of extra time. The Italian language has more than 250,000 words, including many synonyms that can be harnessed for rapid learning. Normally, one word will have at least two to three synonyms, so instead of learning only one new way to express yourself in Italian, you can learn three or four—not bad right? When you’re learning a new word, look it up in an Italian dictionary. It’ll of course show you the meaning or the translation, but should also give you all the synonyms. Add all of them to your vocabulary notebook and try to use them in context throughout your day. Don’t use the same word every single time, but try to cycle through all synonyms. Extra tip: each word will obviously be spelled and pronounced differently, so try to use the synonyms both in writing and out loud to flex additional language skills. While tried-and-true study tools like worksheets, flashcards and textbooks can certainly be useful for many learners, they’re not necessarily the most exciting way to study. If you ever find yourself procrastinating your studies, or having to re-read the same page over and over, you’ll want to try out some more entertaining tools that can keep your attention up so your momentum doesn’t plateau. For some, that might mean watching Italian movies or relaxing with an Italian magazine on a lazy Sunday. For others, it might mean reading Italian blogs on your favorite topics. Think about what naturally holds your attention, and then do it in Italian. To really get the most out of this study technique, you can use innovative tools like FluentU that combine active learning with entertainment. 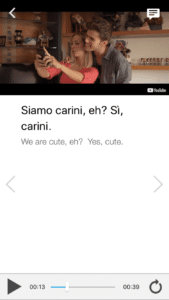 FluentU helps you get comfortable with everyday Italian by combining all the benefits of complete immersion and native-level conversations with interactive subtitles. Tap on any word to instantly see an image, in-context definition, example sentences and other videos in which the word is used. Access a complete interactive transcript of every video under the Dialogue tab, and review words and phrases with convenient audio clips under Vocab. Once you’ve watched a video, you can use FluentU’s quizzes to actively practice all the vocabulary in that video. Swipe left or right to see more examples of the word you’re on. 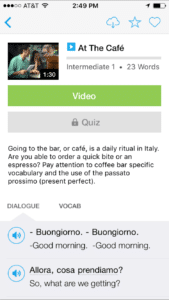 FluentU will even keep track of all the Italian words you’ve learned to recommend videos and ask you questions based on what you already know. Plus, it’ll tell you exactly when it’s time for review. Now that’s a 100% personalized experience! The best part? You can try FluentU for free! Start using Fluent on the website, or better yet, download the app for iOS or Android devices. 5. Get Out and About… in Italian! If you really intend to improve your Italian quickly, then you have to expose yourself to the language as much as possible. The fastest way is to move to Italy and totally immerse yourself in the language. Of course, that’s not possible for most language students. So the next fastest way to improve is to find the Italian native speakers already in your area. For starters, attend in-person meetings or events in Italian. There are Italian communities all over the world—you can find one near you by searching the National Italian American Foundation affiliates, this list of Italian American organizations or Meetup groups in your area. Besides learning a lot from their local events, you’ll have the opportunity to meet native speakers and practice your language skills live. What you can do before going to the meetings in order to give your language skills a boost is to look up some vocabulary related to the place where the event is happening. For example, if you’re meeting in a museum, try to learn as many new relevant words as possible before arriving. You’ll then be able to understand the native speakers and you’ll feel confident enough to join the discussions. You can also join classes that are taught in Italian. And I don’t just mean typical Italian language courses, which are certainly useful but can be a bit costly. Look for cooking classes, exercise classes or even an Italian book club. 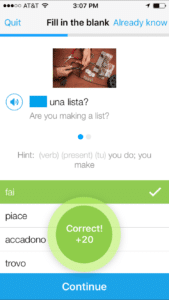 These are great ways of practicing Italian and meeting native speakers. Again, Meetup groups and the Italian organizations noted above are great resources for this. Ready to take your Italian to next level? Start putting those tips into practice and you’ll become a master in no time! Mariya is an Italian language teacher with a passion for (or rather, an addiction to) coffee and Italian culture. She is the founder of MyLanguage. She creates personalized lesson plans for people who feel the same way about the language and teaches private online lessons. If you liked this post, something tells me that you'll love FluentU, the best way to learn Italian with real-world videos. FluentU brings language learning to life with real-world videos. Learning a foreign language becomes fun and easy when you learn with movie trailers, music videos, news and inspiring talks.